Hello, I am David Andersson, and welcome to this week’s feedback post. In it I will discuss one class for the PDW-57 and the S12 you suggested on the weapon guide for those guns. If you would like to be a part of this series in the future leave a comment on the upcoming weapon guides with your favorite class setup for the weapon. The class setup for the PDW-57 comes from Redstone Carnage who suggested to use the PDW-57 with long barrel, quickdraw and the reflex sight. The reflex sight certainly makes it easier to take on enemies at long range and the long barrel enhances that even further. I found it was hard to compete with the weapons that are more suited for longer range engagements due to the higher recoil. To avoid missing sometimes it is worth shooting in burst. Other than that I like the class, but it is worth trying to avoid long range engagements. 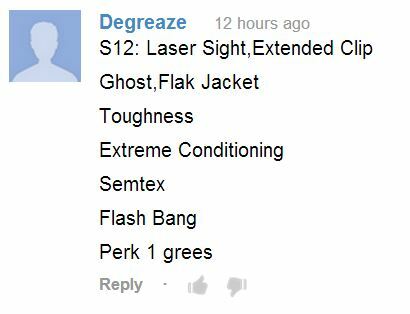 Degreaze likes to use the S12 with the laser sight and extended clip, ghost, flak jacket, toughness, extreme conditioning, semtex and a flashbang. With this class you can be very aggressive and in positions enemies don’t expect you to be in, especially at the start of a game. I found that since I was usually among the enemies that often I didn’t need flak jacket. I switched it for lightweight and the speed with which you can change position is incredible. You will always be where enemies don’t expect you to be and catch them off guard so they will be easy pickings. However, I did miss flak jacket when somebody started to use the grenade launcher repetitively. This entry was posted in CoD: Black Ops 2, Weapon Guide and tagged auluftwaffles, Black Ops 2, Call of Duty, Class Setup, Feedback, Games, gaming, guide, PDW-57, PDW-57 Class Setup, PDW-57 Class Setup Feedback, S12, S12 Class Setup, S12 Class Setup Feedback, video game guides, Video Games, Weapon Guide. Bookmark the permalink.